Music lessons (by appointment only) may take place outside of these hours. 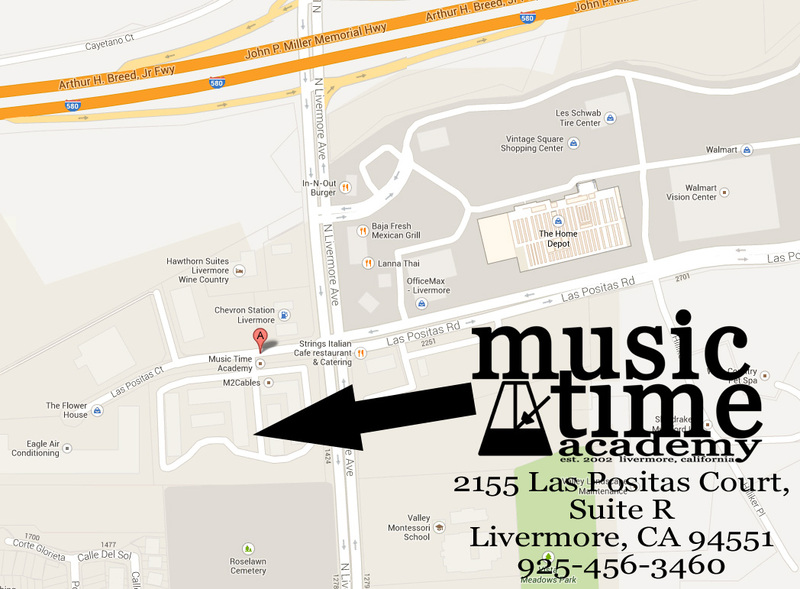 Music Time Academy is located inside of Las Positas Excutive Center (featuring Western Dental) on the corner of Las Positas Rd and North Livermore Ave, near the Chevron with Splash’s Car Wash. Once on Las Positas Court, turn left into the first driveway (by Sherwin Williams Paints). Continue driving straight, passing Sherwin Williams on your right, towards the tall, red State Farm signs at the end of the parking lot. Music Time Academy is located near the rear of the 2155 building, on the right-hand side, at Suites R, U and V.
Looking for music classes? Schedule a free trial private lesson by filling out our easy online form!